A tetrapeptide (example: Val-Gly-Ser-Ala) with green highlighted N-terminal α-amino acid (example: L-valine) and blue marked C-terminal α-amino acid (example: L-alanine). The C-terminus (also known as the carboxyl-terminus, carboxy-terminus, C-terminal tail, C-terminal end, or COOH-terminus) is the end of an amino acid chain (protein or polypeptide), terminated by a free carboxyl group (-COOH). When the protein is translated from messenger RNA, it is created from N-terminus to C-terminus. The convention for writing peptide sequences is to put the C-terminal end on the right and write the sequence from N- to C-terminus. Each amino acid has a carboxyl group and an amine group. Amino acids link to one another to form a chain by a dehydration reaction which joins the amine group of one amino acid to the carboxyl group of the next. Thus polypeptide chains have an end with an unbound carboxyl group, the C-terminus, and an end with an unbound amine group, the N-terminus. Proteins are naturally synthesized starting from the N-terminus and ending at the C-terminus. While the N-terminus of a protein often contains targeting signals, the C-terminus can contain retention signals for protein sorting. The most common ER retention signal is the amino acid sequence -KDEL (Lys-Asp-Glu-Leu) or -HDEL (His-Asp-Glu-Leu) at the C-terminus. This keeps the protein in the endoplasmic reticulum and prevents it from entering the secretory pathway. The C-terminus of proteins can be modified posttranslationally, most commonly by the addition of a lipid anchor to the C-terminus that allows the protein to be inserted into a membrane without having a transmembrane domain. One form of C-terminal modification is prenylation. During prenylation, a farnesyl- or geranylgeranyl-isoprenoid membrane anchor is added to a cysteine residue near the C-terminus. Small, membrane-bound G proteins are often modified this way. Another form of C-terminal modification is the addition of a phosphoglycan, glycosylphosphatidylinositol (GPI), as a membrane anchor. The GPI anchor is attached to the C-terminus after proteolytic cleavage of a C-terminal propeptide. The most prominent example for this type of modification is the prion protein. 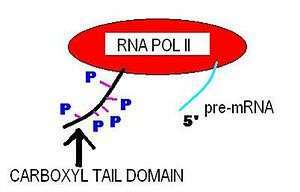 RNA POL II in action. The C-terminal domain of some proteins has specialized functions. In humans, the CTD of RNA polymerase II typically consists of up to 52 repeats of the sequence Tyr-Ser-Pro-Thr-Ser-Pro-Ser. This allows other proteins to bind to the C-terminal domain of RNA polymerase in order to activate polymerase activity. These domains then involved in the initiation of DNA transcription, the capping of the RNA transcript, and attachment to the spliceosome for RNA splicing. ↑ Meinhart A, Cramer P (July 2004). "Recognition of RNA polymerase II carboxy-terminal domain by 3'-RNA-processing factors". Nature. 430 (6996): 223–6. doi:10.1038/nature02679. PMID 15241417. ↑ Brickey WJ, Greenleaf AL (June 1995). "Functional studies of the carboxy-terminal repeat domain of Drosophila RNA polymerase II in vivo". Genetics. 140 (2): 599–613. PMC 1206638 . PMID 7498740.